Other Notes: 30 IBUs. Juicy, hazy, hoppy. Brewer Description: (from website) It’s really not fruit juice, but we won’t blame you for thinking so. Fake Juice. Real Beer. NE IPA. 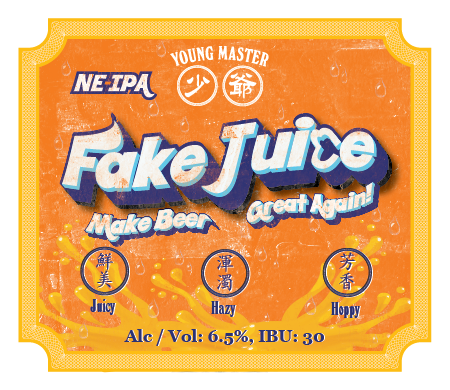 Loaded with Citra and Mosaic, Fake Juice is a NE IPA without any fruit addition. This is a hoppy, juicy, hazy IPA filled with note of grapefruit, guava and mango. Combination of soft bitterness and fluffy body makes this beer as sessionable as a glass of juice, if not more. Intro: A 946ml crowler, filled on 21st December 2017. Poured into a Lost Abbey teku glass. Appearance: A hazy dark orange colour with a just over one finger white head that had good retention and left some lacing. Aroma: Mango, orange rind and a touch of lemon. Taste: Like the aroma, there’s tropical and citrus fruitiness, mainly mango, citrus rind, grapefruit and a touch of pineapple. Overall: Nice, juicy and easy to drink.